Special offers Columbus Special offers U.S.A. This Columbus, Ohio hotel features comfortable guestrooms, furnished with many modern amenities, and is located only minutes from The Ohio State University as well as many other popular points of interest. Area attractions, including the Greater Columbus Convention Center and the Ohio State Fairgrounds can be found only a short drive away from the Hilton Garden Inn Columbus-University Area. A number of restaurants and shopping centers are also located nearby. Many modern conveniences, including free high-speed internet access and in-room flat-screen TVs, are standard at the Columbus-University Area Hilton Garden Inn. Guests can also enjoy breakfast at the on-site Great American Grill or snacks from the 24-hour convenience store. Experience spacious accommodations furnished with modern amenities including MP3 radios and on-site dining options at this all-suite hotel, situated near popular Columbus attractions and points of interest. Start the morning at the Columbus Embassy Suites with a free cooked-to-order breakfast or with an energizing workout in the modern fitness center. Spend the afternoon relaxing by the indoor/outdoor pool. Finish the evening with a delicious meal at the on-site restaurant or attend the free evening manager's reception. Explore the surrounding area with the Embassy Suites Columbus's free shuttle service within a 5 mile radius, including Port Columbus International Airport and Easton Towne Shopping Center. Ohio State University, as well as the Columbus Convention Center, is also easily accessible. Providing the comforts of the suburbs and only a short drive from the attractions of downtown Columbus, this full service hotel offers state-of-the-art amenities along with first-class accommodations. The Hilton Columbus at Easton is ideally located in the center of the Easton Town shopping center. Guests at the hotel can easily discover gourmet restaurants, unique shops and entertainment options within walking distance. Ohio State University and Columbus International Airport are also only moments away. With free airport shuttle service, wireless internet access and on-site gourmet dining, every stay at the Columbus at Easton Hilton is sure to be pleasant. Guests can also take advantage of the modern fitness center, as well as the hotel's spacious and versatile meeting and banquet facilities. Conveniently located just off I-270 and steps from the area's main points of interest, this hotel features a free hot breakfast as well as signature Cloud Nine beds. Discover over 100 unique shops, restaurants and entertainment options at Easton Town Center, situated seconds from the Columbus-Easton Area Hampton Inn and Suites. Easily explore other nearby attractions and businesses with the hotel's free local shuttle service. Begin the morning with the Hampton Inn Columbus-Easton Area's with a workout in the state-of-the-art fitness center or with a swim in the indoor pool. Relax at the end of the day and enjoy an in-room movie on flat-screen TVs. Minutes from many of Columbus, Ohio's main points of interest, this hotel is conveniently located off I-70 and features many thoughtful and contemporary amenities. The Hampton Inn Columbus I-70E/Hamilton Road provides guests with a delicious free daily hot breakfast as well as free freshly baked evening cookies. Guests at the hotel can also enjoy free wireless internet access along with an on-site fitness center, complete with a swimming pool. A variety of area sites, including Ohio State University, can be found close to the Hamilton Road Columbus Hampton Inn. Berliner Park, the Port Columbus International Airport and a number of shopping centers are also nearby. Overlooking the Scioto River and only moments from major downtown Columbus, Ohio attractions, this all-suite hotel features spacious 2-room suites, complete with many modern amenities. The Doubletree Guest Suites Columbus boasts an ideal location, connected to the Huntington Bank Center via a covered walkway. Guests at the hotel can also easily access the state Capitol as well as the Greater Columbus Convention Center, museums, restaurants and shops. Guests at the Columbus Doubletree are warmly greeted with a fresh chocolate chip cookie upon check in. Guests can then take advantage of the hotel's wireless internet access or the modern fitness center. The hotel also offers in-room microwaves and refrigerators as well as on-site dining at the Caucus Room Restaurant. Within walking distance of many popular area attractions, including the Columbus Convention Center, this hotel features comfortable rooms and modern amenities, in the heart of the downtown area. Major attractions, including the campus of Ohio State University and the Arena Grand Theatre, can be found near the Hampton Inn and Suites Columbus Downtown. Art galleries, restaurants, shopping centers and a vibrant nightlife are also only moments away. 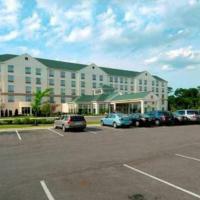 The Downtown Columbus Hampton Inn and Suites provides a free daily breakfast as well as free high-speed internet access. The hotel also boasts a state-of-the-art fitness center along with an indoor swimming pool and sauna. Located in Columbus’s German Village, this motel is 2 miles from the Greater Columbus Convention Center. It features free Wi-Fi and a continental breakfast. The simply furnished guest rooms at the German Village Inn Motel are equipped with a refrigerator and coffee maker. Free local calling and cable TV with the HBO channel are provided. Ohio State University is a 15-minute drive from Motel German Village. The Magic Mountain Fun Center is 15 miles away. The Best Western Suites offers all the right amenities for business travelers and tourists at an unbeatable value and convenient location. Guests will also be 3 miles from the Hollywood Casino. 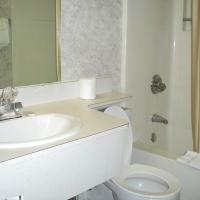 The hotel offers comfortable lodging for travelers visiting Columbus for business, government work or pleasure. This Columbus hotel is conveniently located 2 miles from highway I-270 and 6 miles on the west side of Columbus off highway I-70 at Junction 91. The Hotel offers complimentary pizza on Mondays and Wednesdays to guests for free. An indoor pool and fitness center are also available. Providing free shuttle service within a 3 mile radius and a fully equipped fitness center, this property in downtown Columbus, Ohio is steps from the Columbus Convention Center. The Crowne Plaza Columbus - Downtown offers high-speed internet access and a mini-refrigerator in each guestroom. Guests can relax in the indoor pool or visit the on-site game room. After a day of sightseeing, guests can enjoy a beverage at the Boulevard Bar, located in the hotel's lobby. Nationwide Arena sporting and entertainment venue is steps from the Downtown - Columbus Crowne Plaza. Other attractions within walking distance include the Columbus Museum of Art and Palace Theater. Located off Interstate 71 and 11 miles north of Columbus, Ohio, this hotel is a 10-minute drive from Magic Mountain Fun Center. It offers on-site dining and free in-room Wi-Fi. Contemporary rooms at the North Columbus Crowne Plaza include dark hardwood furniture and a CD player. Guests can watch cable TV or work at the large desk. An indoor pool, hot tub, and 24-hour gym are part of this Columbus hotel. A tour desk and concierge services are available. Christino's Restaurant, located off of the lobby, serves American dishes for breakfast, lunch, and dinner. The Lobby Lounge boasts a full-service bar and TVs tuned to sporting events. The Crowne Plaza Columbus North - Worthington provides shuttle service to locations within a 4-mile radius, such as The Ohio Railway Museum. Port Columbus International Airport is 14 miles from the hotel. This hotel is a 15 minute drive from both Central Columbus and Port Columbus International Airport. It serves breakfast every morning and features a hot tub and indoor pool. Free Wi-Fi access and cable TV are available in every room at Holiday Inn Express Hotel & Suites Columbus Southeast. They come with tea and coffee-making facilities. Guests can work out in the fitness center or use the business center at the hotel. The front desk is open 24 hours a day and there is also a laundromat on site. Motts Military Museum is 3 miles from the Southeast Columbus Holiday Inn Express Hotel & Suites. The Nationwide Arena is 13 miles away. This hotel located in Columbus, Ohio is only a short distance from the Ohio Expo Center. It offers a fitness center and an indoor pool. Each guest room is equipped with cable TV, a microwave and tea and coffee making facilities. All are air conditioned and have free Wi-Fi access. The Holiday Inn Express Hotel & Suites Exit I-71 Ohio State Fair - Expo Center serves a hot breakfast daily. There is also a business center on site. The Ohio State University is 2 miles from the Ohio State Fair - Expo Center Holiday Inn Express. Port Columbus International Airport is a 10-minute drive away. Free parking is offered at the hotel. Only moments from Columbus International Airport with free shuttle service, this Columbus, Ohio hotel offers easy access to the center of the city and features free wireless internet access and comfortable guest rooms. Rooms come with a microwave, a small refrigerator and tea/coffee-making facilities. Fresh cooking are provided on weeknights. Guests can enjoy the Manager's Reception held nightly on Monday-Wednesday. In the area surrounding the Best Western Port Columbus are the offices of Sears, JP Morgan Chase, and many more. Local attractions, including the Ohio State Fairgrounds and the Columbus Convention Center are also easily accessible. 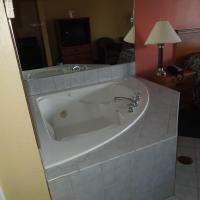 While staying at the Port Columbus Best Western, guests can relax in the indoor swimming pool. The pet-friendly hotel also provides an on-site fitness center and a laundromat. Interstate 270 and the Columbus Zoo and Aquarium are minutes from this Columbus, Ohio hotel. The hotel offers breakfast at the on-site restaurant and free high-speed internet access. At the Courtyard Columbus West, guest rooms feature a coffee maker and pay-per-view movies. The rooms also have free Wi-Fi. Select rooms provide a living area and mini-refrigerator. An indoor pool and a fitness center are available at the Columbus West Courtyard. The hotel offers free coffee in the lobby and a full-service business center. Ohio State University is a short drive from the Columbus Courtyard West. The Center of Science and Industry is also located nearby. The Ohio State University and the Ohio Stadium are within walking distance of this Columbus, Ohio hotel that features a free hot breakfast, free high-speed internet and an indoor heated swimming pool. Each traditionally decorated guest room comes equipped with a coffee maker and a flat-screen TV that features cable channels. This Holiday Inn Express Hotel & Suites Columbus University Area – Ohio State University is just a short drive from The Columbus Zoo. Many area attractions are within walking distance of the hotel including, the Ohio Expo Center. Guests at the Ohio State University – Columbus University Area Holiday Inn Express Hotel can take advantage of the free shuttle service within a 3 mile radius. 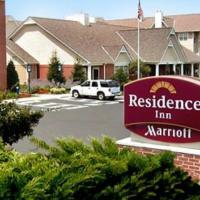 This all-suite hotel is located near Port Columbus International Airport and the Easton Town Center mall. Every suite features a 42-inch flat-screen TV and high-speed internet access. Embassy Suites Columbus-Airport offers a mini-refrigerator and microwave in each suite. A wet bar and remote printing capability are also included in each room. Guests can start the day with a free hot breakfast every morning. A free evening Manager's Reception is available nightly. Guests can also purchase a sandwich or espresso drink from the on-site Flying Spoons restaurant. At the Embassy Suites near the Columbus Airport, guests can use the indoor pool or the spacious fitness center. A 24-hour business center is also available at the hotel. This hotel in Columbus is off of Interstate 71 and is a 15-minute drive from downtown Columbus. The hotel features free continental breakfast, free Wi-Fi and an on-site lounge. Days Inn Columbus North features satellite TV with HBO and ironing facilities in every guest room. Air-conditioning and free local calls are also included. Columbus North Days Inn has free weekday newspapers in the lobby and the front desk is open 24-hours. Guests can get a drink and appetizers at Club 161. Magic Mountain Fun Center is 3 miles from the Columbus North Days Inn. Easton Town Center Shopping Mall and the Columbus Convention Center are both within a 15-minute drive from the hotel. Just 2 miles from downtown Columbus, this hotel features free parking and free Wi-Fi in every room. Rooms at the Travelodge Columbus include a microwave and refrigerator. The rooms also have a coffee maker and hairdryer. The Columbus Travelodge serves a daily continental breakfast and provides a free weekday newspaper. The hotel also has laundry facilities. The Travelodge Columbus is within a 15-minute drive of Ohio State University and Ohio Stadium. The Columbus Museum of Art is 4 miles from the hotel. This hotel is off Interstate 70 and is 9 miles from downtown Columbus. This hotel features free Wi-Fi in every room. The rooms at the Americas Best Value Inn Columbus/West include a refrigerator and coffee maker. The rooms also feature cable TV. The Columbus Americas Best Value Inn provides a daily continental breakfast. The hotel has laundry facilities. The West Columbus Americas Best Value Inn is 10 miles from Ohio State University. The Columbus Zoo is 20 miles from the hotel. This hotel is located off Interstate 70 and 10 miles from downtown Columbus. This hotel offers a microwave and refrigerator in every room. Rooms at Knights Inn Columbus come with wired internet access and cable TV. The rooms also feature a wake-up service. The Columbus Knights Inn is within a 20-minute drive of Ohio State University. Magic Mountain Fun Center is within a 5-minute walk of the hotel. This Columbus hotel is a 10 minute drive from Central Columbus and Ohio State University. The Sheraton Four Points offers an indoor heated pool, 24-hour gym and rooms with free Wi-Fi. Four Points by Sheraton Columbus guest rooms are spacious and furnished with a work desk and lounge chair. A flat-screen cable TV, coffee-making facilities and free bottles of water are included. The on-site cafe and restaurant serves a buffet breakfast and a full menu for dinner. A bar is open in the evening. Guests at the Columbus Four Points Sheraton have free access to the 24-hour business center. Free airport shuttle service to the Port Columbus Airport is provided and a convenience store is on site. Franklin Park Conservatory is a 5 minute drive from the Four Points Columbus Sheraton. The Columbus Convention Center and Nationwide Sports Arena are 10 minutes away. This hotel is 6 miles from downtown Columbus and across the street from the Great Southern Shopping Center. The hotel offers free parking and rooms with free Wi-Fi. Kozy Inn rooms include a microwave and refrigerator. The rooms are equipped with cable TV and a coffee maker. The Kozy is 6 miles from the Columbus Motor Speedway. The Fort Rapids Waterpark is 11 miles from the hotel. This hotel is 8 miles from the Ohio State University. The hotel offers free Wi-Fi and a continental breakfast. The Hawthorn Suites Hotel North features a heated outdoor pool. All rooms include a sofa bed, microwave and refrigerator. Ohio State Fairgrounds is less than 10 minutes from the Suites. This hotel offers an on-site laundry facility and non-smoking rooms. In Columbus, Ohio, this hotel is 9 miles from Ohio State University. The hotel features a gym along with free Wi-Fi and cable TV with HBO in the rooms. Guest rooms at Motel 6 Columbus North Polaris include coffee facilities. Free newspapers and local telephone calls are available in the rooms. The Columbus Zoo & Aquarium are 12.5 miles from the Columbus North Motel 6. Downtown Columbus is 10.5 miles away. This Knights Inn is located in downtown Columbus and is a 5-minute drive to the Columbus Convention Center. This pet-friendly motel offers free Wi-Fi and a continental breakfast. Guest rooms at the Downtown Columbus Knights Inn include cable TV with HBO and a clock radio. A private bathroom is also provided. The Columbus Knights Inn is a 5-minute drive to Nationwide Arena and the Columbus Museum of Art. The Franklin Park Conservatory is only 10 minutes away by car. This hotel is one mile from the Ohio State University and 8 miles from downtown Columbus. The hotel offers an outdoor pool, business center, gym and rooms with free Wi-Fi. Varsity Inn OSU North rooms include a coffee maker and cable TV. 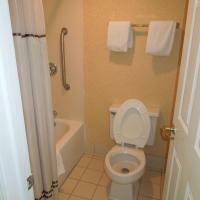 The rooms also have a private bathroom. The Varsity Inn is a pet friendly hotel and offers meeting facilities. The hotel offers free newspapers in the lobby. The OSU North Varsity Inn is 10 miles from the Franklin Park Conservatory. The hotel is 2 miles from the Ohio State University Golf Course. Ohio State University is located across from this Columbus hotel. Free Wi-Fi is available in the guest rooms and the hotel features an outdoor pool. Every room at the Varsity Inn OSU South is equipped with cable TV and coffee facilities. Select rooms are furnished with a microwave and a refrigerator. The Columbus Zoo and Aquarium is 15.2-miles from the hotel. German Village, with shopping and dining options, is 4.5-miles from the South OSU Varsity Inn. This hotel in Columbus, Ohio is 9.3-miles from the University of Ohio. Each room at the hotel includes cable TV, free Wi-Fi and free parking is possible. At the Rodeway Inn North Columbus, guest rooms provide free local telephone calls. North Columbus Rodeway Inn offers free coffee in the lobby along with a daily continental breakfast. The Port Columbus International Airport is 14.7-miles away. Rodeway Inn Columbus North is located next to the Continent Mall Shopping Center. Renaissance Columbus Downtown Hotel offers a fitness center and a rooftop pool, less than a mile from Nationwide Arena and the Convention Center. Rooms feature views of downtown Columbus and free Wi-Fi. All rooms at Renaissance Columbus Downtown include air conditioning and a bathroom with a hairdryer. Each also has cable TV and in-room tea- and coffee-making facilities. The hotel’s restaurant, Latitude 41, offers modern cuisine in a chic atmosphere. Bar 41 is open for lunch and dinner, also offering internet services. Renaissance Columbus Downtown Hotel is 2 miles from the Brewery District and less than one mile from the Center of Science and Industry, and the Columbus Museum of Art. This hotel in Columbus, Ohio provides rooms with 32-inch flat-screen cable TVs and HBO. Free scheduled shuttle services are available to Portland Columbus International Airport. Guest rooms at the Columbus Airport Marriott include coffee facilities and a desk. Pay-per-view movies are also available. An indoor pool and a gym are available at the Marriott Columbus Airport. RiverCity Grille and Lounge is also on site. The hotel is 10 minutes from Easton Town Center. Columbus Zoo and Aquarium is 22 miles from the Airport Columbus Marriott. With a free shuttle service to/from Port Columbus International Airport, this Marriott hotel is 15 minutes from downtown Columbus, Ohio. It features an indoor pool and free in-room Wi-Fi. The guest rooms at the Columbus Airport Courtyard have a flat-screen TV and a sitting area. A coffee maker, hairdryer, and ironing facilities are provided. The facilities at Courtyard Columbus Airport include a gym and business center. Laundry and dry cleaning services are available. Ohio State University is a 15-minute drive from Courtyard Columbus Airport. Franklin Park Conservatory is 5 minutes from the hotel. This hotel is located in Easton Town Center, which features shopping, dining and entertainment. The hotel offers a heated indoor pool and rooms with flat-screen TVs. Courtyard Columbus Easton rooms include a sitting area and work desk. The rooms are equipped with free Wi-Fi and a coffee maker. Guests at the Courtyard Easton can dine in the restaurant for breakfast. The hotel also offers free newspapers in the lobby. The Courtyard is 11 miles from downtown Columbus. German Village is within a 18-minute drive of the hotel. This Columbus hotel is located 5 miles from The Ohio State University. The hotel features The Exchange Lounge, serving cocktails, and suites that include fully equipped kitchens. Residence Inn Columbus Downtown suites come equipped with 32-inch, flat-screen TVs and free Wi-Fi. Each suite comes furnished with a dining room and a living room with sofa bed. The Columbus Downtown Residence Inn provides grocery shopping service with delivery to guest suites. The hotel has a gym and guest laundry facilities. A breakfast buffet is served daily. Huntington Park, home of the Columbus Clippers, is a 4-minute drive from the Residence Inn. The hotel is 17 miles from the Columbus Zoo and Aquarium. This hotel offers air-conditioned rooms with kitchen facilities, a free buffet breakfast and a seasonal outdoor pool. There are laundry facilities on site. The AMC Movie Theater is 13 miles away. Residence Inn Columbus Easton’s rooms have a flat-screen TV with access to cable channels and air conditioning. Each room has a quaint fireplace. Each unit features a well-equipped kitchen with basic appliances such as a conventional oven, microwave and fridge. Cooking utensils are provided for each room. Residence Inn Columbus Easton helps guests with grocery shopping. Other services include dry cleaning and an evening reception in the lobby. Residence Inn Columbus Easton is 18.3 miles from Ohio State University. Easton Town Center is less than a 5 minute drive away. Located in Downtown Colombus, Ohio, this hotel offers modern rooms with a flat-screen TV and free Wi-Fi. Facilities include an indoor pool, a whirlpool, and a gym. The air-conditioned rooms of Courtyard Columbus Downtown are decorated with warm, natural colors. All rooms are equipped with a work desk, coffee and tea making facilities, and cable TV with movie channels. Guests can enjoy a full hot breakfast at the The Courtyard Café every morning. 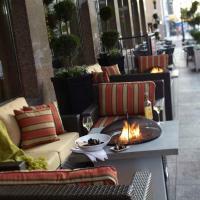 The Fireside Lounge serves beer, wine and cocktails Monday through Saturday. Courtyard Columbus also offers a 24-hour front desk, laundry and dry cleaning facilities, and a concierge service. Courtyard Columbus Downtown is less than a 5-minute drive from the Greater Columbus Convention Center, the Palace Theatre, and Capitol Square. This hotel in Columbus, Ohio offers an indoor swimming pool and a hot tub. It also serves a hot continental breakfast daily. Ohio State University is less than one mile away. The brightly decorated rooms at the Fairfield Inn & Suites Columbus OSU include cable TV, a work desk and free Wi-Fi access. Guests can visit the fitness center or retrieve weekday newspapers from the front desk. A business center with fax and copy services is also available. Various dining options, including Applebee’s and Bob Evan’s Restaurant are within one mile of the hotel. The Wilson Road Golf Course is just 7 miles from the Fairfield Columbus by Marriott. Downtown Columbus is 8 miles away. This all-suite hotel is 15 minutes south of downtown Columbus and Port Columbus Airport. It offers free scheduled airport transportation, an outdoor sport court and suites with a fully equipped kitchen. 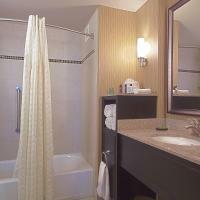 Hawthorn Suites by Wyndham offers one- and two-bedroom suites. Each has a spacious living area featuring a sofa bed, dining table and 32-inch LCD TV. Cable TV and free Wi-Fi are included. Guests can relax by the outdoor pool or firepit, play on the basketball courts or use the barbecue grills. Hawthorn Suites by Wyndham Airport East Hotel also has a lobby business center. Hawthorne Suites Airport East hotel provides a hot breakfast buffet every morning and a light reception is offered on select nights. Ohio State University and the Scioto Audubon Metro Park are a 20-minute drive from this Wyndham Airport Hawthorn Suites hotel. The Greater Columbus Convention Center and Nationwide Arena are 15 minutes away. This hotel is located 8.6 miles from The Ohio State University and 10.3 miles from downtown Columbus. The pet-friendly hotel serves a daily continental breakfast and features rooms with free Wi-Fi. 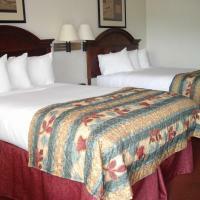 Red Roof Inn Columbus North offers air-conditioned rooms furnished with a coffee maker and cable TV. For added convenience a hairdryer and ironing facilities are provided. Local phone calls are free through the in-room telephone. Guests of the Columbus North Red Roof Inn are welcome to work out in the gym or use the laundry facilities. Snacks can be purchased at the snack bar and the front desk will arrange dry cleaning upon request. The hotel has free parking available. Port Columbus International Airport is 14.3 miles from the Red Roof Inn. Minerva Lake Golf Course is a 10-minute drive away. 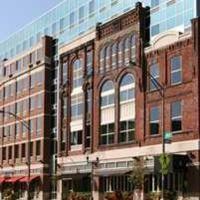 This hotel is less than 5 miles from the Columbus Convention Center and the COSI Science Museum. The hotel offers a continental breakfast, free Wi-Fi and free on-site parking. Guest rooms at the Econo Lodge Columbus feature cable TV and ironing facilities. Some rooms include a refrigerator. Free services at the Columbus Econo Lodge include 24-hour coffee and juice and USA Today newspapers. Fax services are also available. The German Village and Columbus Museum of Art are within 5 miles of the Econo Lodge. This pet-friendly hotel is right off Interstate 70 and 15 minutes from downtown Columbus. It serves a continental breakfast every morning. Rooms at the Super 8 Columbus West are furnished with a sofa bed. They are also equipped with a microwave and a refrigerator. Cable TV and free Wi-Fi are included. 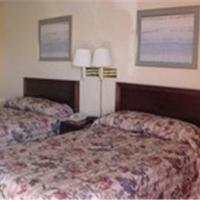 This Columbus Super 8 offers many convenient facilities for guests. The business center has copy, fax, and printing services. The front desk is staffed 24/7, and a guest laundry is available. The Columbus Zoo is 20 minutes from Super 8 Columbus West. The historic Ohio Theater is 10 miles away. The Ohio State Fairgrounds are just under 15 minutes from the hotel. Located just off of Highway 270, this Columbus hotel features an on-site gym and classically furnished rooms equipped with free Wi-Fi and cable TV. Ohio State University is 12 miles away. All rooms at the Quality Inn & Suites Columbus feature a simple design and include a microwave, refrigerator and coffee maker. A comfortable sitting area is provided in each room. A breakfast is served every morning and guests can enjoy free access to the hotel’s fitness room. A business center and laundry facilities are available on site. The Columbus Quality Inn is a 6-minute drive from the Raymond Memorial Golf Course and the Greater Columbus Convention Center is a 14-minute drive away. The Columbus Zoo and Aquarium is 13 miles from the hotel. Ohio State University is a 15-minute drive from this hotel, which features an outdoor pool and free parking. Guest rooms include satellite TV with HBO and free Wi-Fi. The traditionally decorated rooms at America's Best Value Inn-Columbus/North provide a work desk and wake up service. The front desk at this pet-friendly hotel is staffed 24 hours a day. A drive-thru check-in is available, as are guest laundry facilities. Champions Golf Course is an 8-minute drive from Columbus America’s Best Value Inn. The Columbus Zoo and Aquarium is a 20-minute drive away. Adjacent to Ohio State University and the Battelle Memorial Institute, this hotel offers a daily breakfast buffet. Spacious guest studios offer flat-screen TVs and free Wi-Fi. A sitting area with a sofa bed and an iPod docking station are furnished in each studio at SpringHill Suites by Marriott Columbus OSU. Rooms are traditionally styled with warm colors and include a microwave, fridge and coffee maker. Guests at the Columbus OSU SpringHill Suites can relax at the hotel’s indoor pool. A fitness center is available, and business facilities are on site for guest convenience. This hotel is a 5 minute drive from Ohio Craft Museum, and a 9 minute drive from Scioto Country Club. German Village is about 5.5 miles away. Located off Interstate-7, this hotel is 1 mile from Eastland Mall and 8 miles from central Columbus. It features spacious rooms with free Wi-Fi. A microwave and mini-fridge are standard in every simply furnished room at the Knights Inn Columbus East. All rooms include a cable TV and table with chairs. Free parking is available at the Columbus East Knights Inn. Fax and copy services are available at the 24/7 front desk. Port Columbus International Airport and Ohio State University are both a 15 minutes’ drive away. Located just a 13-minute drive from downtown Columbus, this hotel offers free Wi-Fi and an indoor pool. The Columbus Zoo and Aquarium is only 17 miles from the hotel. The rooms at the Red Roof Inn Columbus are decorated in bright red colors and hardwood furniture. They all include a cable TV, microwave, and refrigerator. The hotel boasts an on-site fitness center as well as a business center. Guests can take advantage of a continental breakfast every morning and 24-hour front desk. The Columbus Red Roof Inn is located right off Interstate 270 and is only a 13-minute drive from the Ohio State Fairgrounds. The Columbus Motor Speedway is 15.5 miles away from the hotel. Vous devrez présenter une pièce d'identité valide avec photo et une carte de crédit au moment de l'enregistrement. Veuillez noter que les demandes spéciales ne peuvent pas être garanties et qu'elles sont soumises à disponibilité au moment de l'enregistrement. Elles peuvent entraîner des frais supplémentaires. This Ohio hotel boasts both indoor and outdoor swimming pools and a hot tub. Free Wi-Fi and an on-site restaurant are also featured. Columbus city centre is 15 minutes’ drive away. Every room at the Best Western Plus Columbus North has a cable TV, microwave, and refrigerator. They are decorated in neutral colours and dark wood furnishings. A fitness centre and business centre with copy and fax services are provided at the Columbus North Best Western Plus. Thai Lagoon serves Thai and Chinese cuisine for lunch and dinner. Guests can enjoy a discounted buffet breakfast, which is served each day between 06:30 and 10:00. The Columbus Zoo and Aquarium is 12 miles away. Magic Mountain Fun Center is 10 minutes’ drive away. Located closed to Interstate 71, this Columbus motel features free Wi-Fi and rooms equipped with cable TV. Magic Mountain Polaris amusement park is 5 miles away. Rooms at Columbus Super 8 feature a seating area and an en suite bathroom. Coffee making facilities are also provided. Continental breakfast is served each morning and it features hot coffee or juice with fresh fruit and pastries. Laundry facilities and a 24-hour front desk are offered to guests. Safe deposit boxes are also available. Plenty of shopping and dining are located within 5 minutes’ drive of Super 8 Columbus North and Columbus Zoo and Aquarium is 11 miles away.